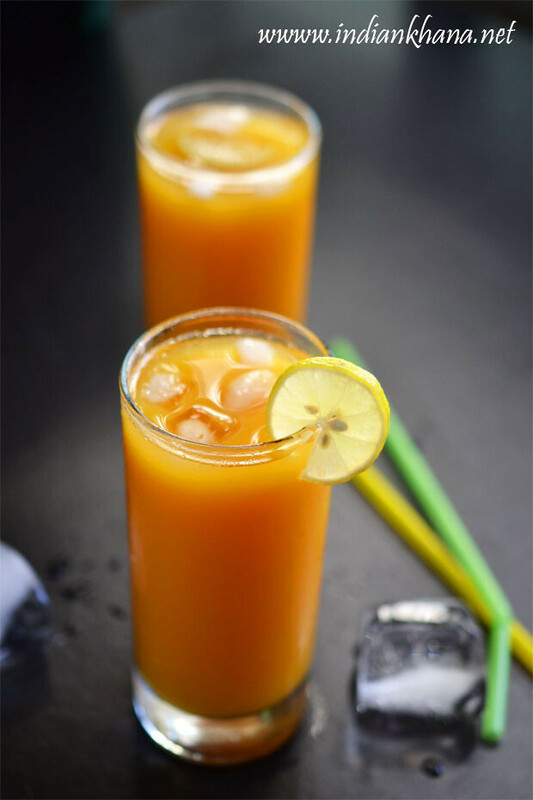 Samvat Pulao, Sama Pulao, Vrat Ke Chawal Ke Pulao, Phalahari Pulao, Bhagar Pulao,Barnyard Millets Pulao, Kuthiravali pulao and we can call this pulao with many other names. 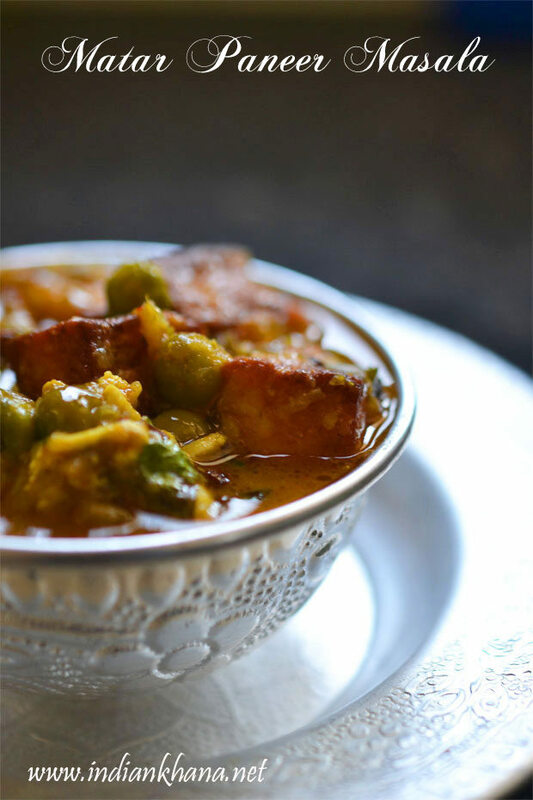 As Navratri is approaching I decided to share some Navratri Fasting (vrat) recipes and starting the series this year with this delicious yet simple Sama Chalwa Ke Pulao. 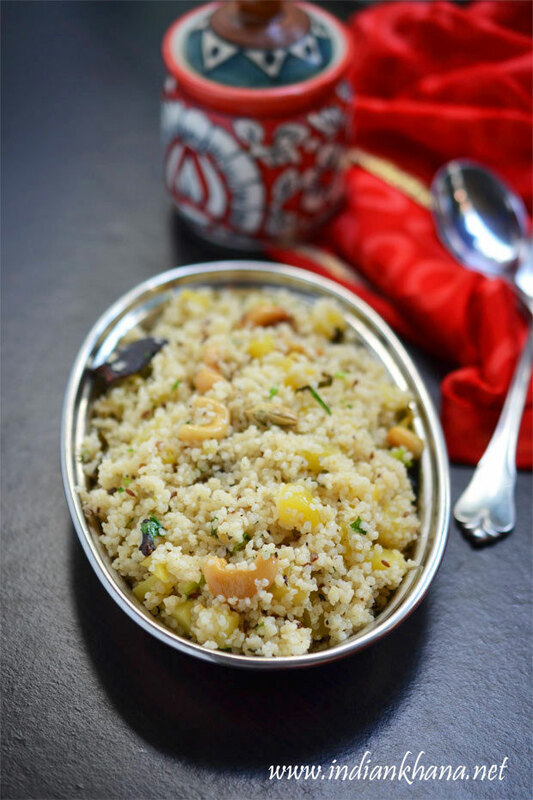 Sama Chawal is Kuthiravali in tamil, Udalu in telgu, to know more about this wonderful millet check out my millet post. 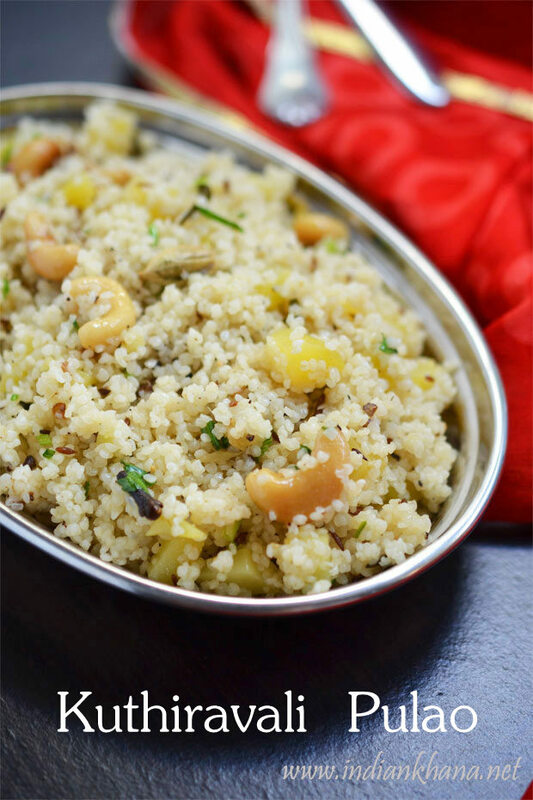 During Navratri fasting or for any fasting only Samvat (barnyard millet) is allow to get and I wanted to share this recipe for very long time but didn't manage to find sama chawal here. 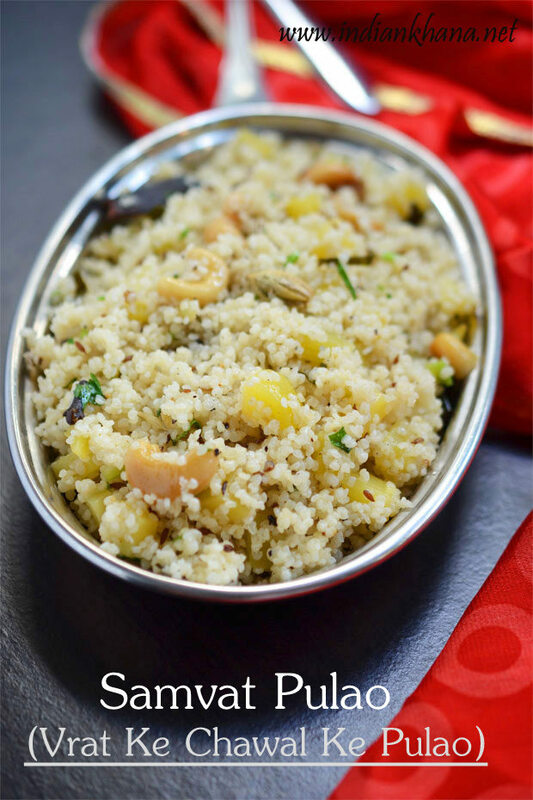 Finally having the millet with me I can share some easy and wonderful recipes which you can try for this Navratri fasting or upwas. 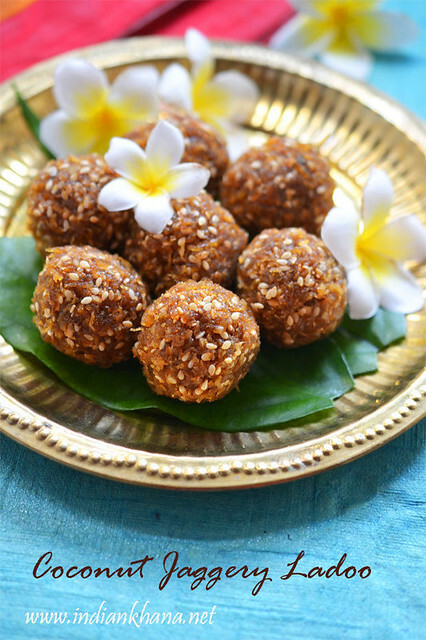 Since there are lot of restrictions with fasting food I have made this recipe to suit for upwas/vrat, you can read more about fasting rules here. This samo rice pulav is gluten-free, vegan (as I used oil and not ghee) and delicious. 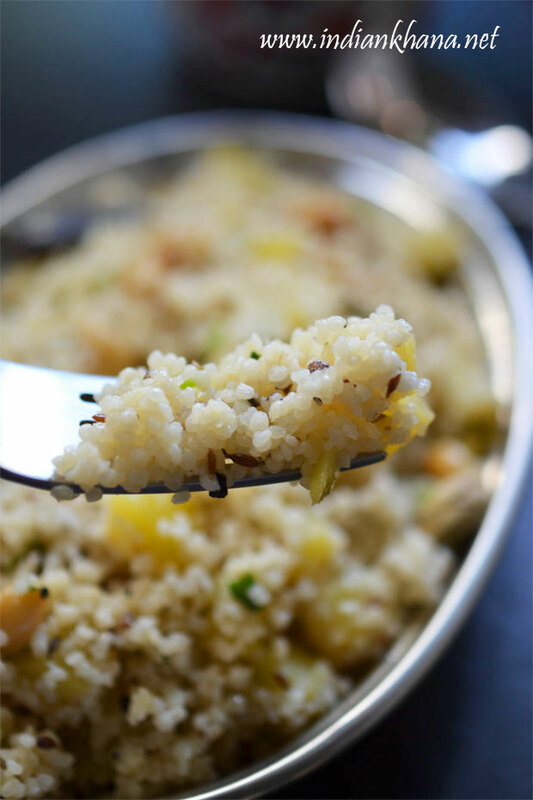 This pulao is delicious and all the flavors come together beautifully, as they say less is more in this recipe it's gets proven the less spices we add the more we enjoy each spice and it's flavor. 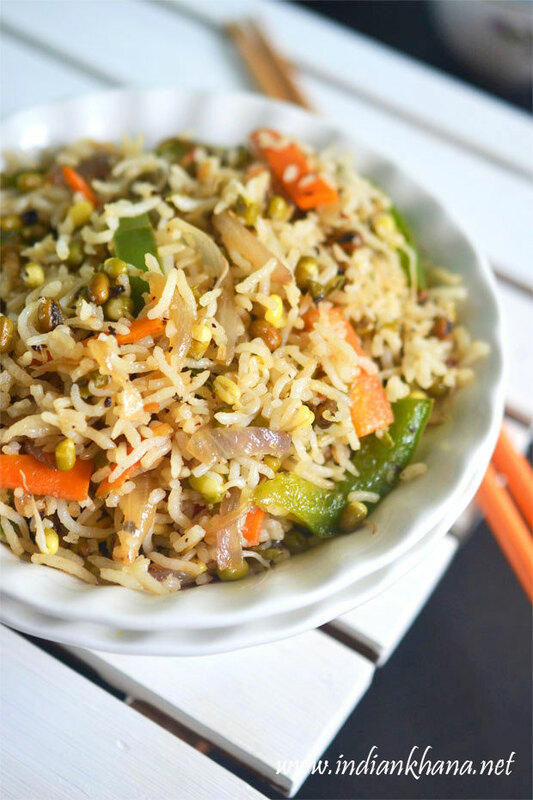 Do not miss the ginger, fresh pepper corn both the ingredients adds magic to this simple pulao. 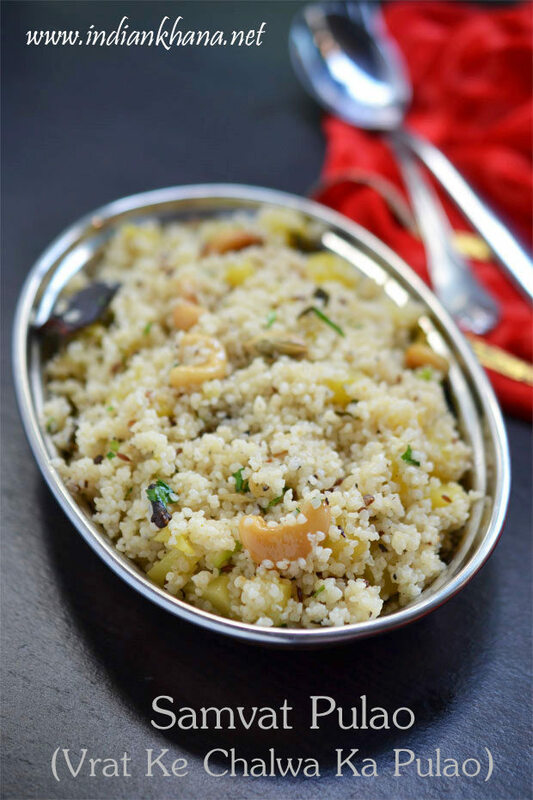 Gluten-free, vegan pulao made with barnyard millets suitable for Navratri Vrat (fasting). 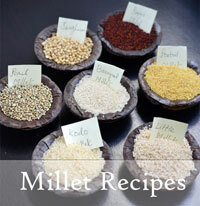 Wash and soak samvat rice (barnyard millet) for 15 mins or you can soak for 2-3 hours too. Meanwhile peel and dice potato, finely chop green chili, coriander leaves. 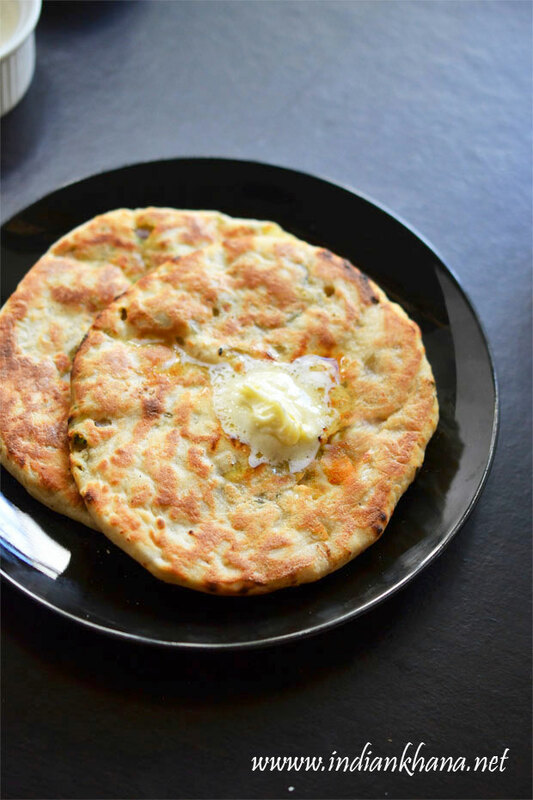 In a pan or kadai heat ghee or oil, add cumin seeds, cloves, crushed green cardamom, cinnamon and saute until cumin splutters. Add ginger, green chilies, cashewnuts and saute until cashews becomes light brown. Now add potato, mix and cook for 1-2 mins in medium flame until potato gets half cooked. 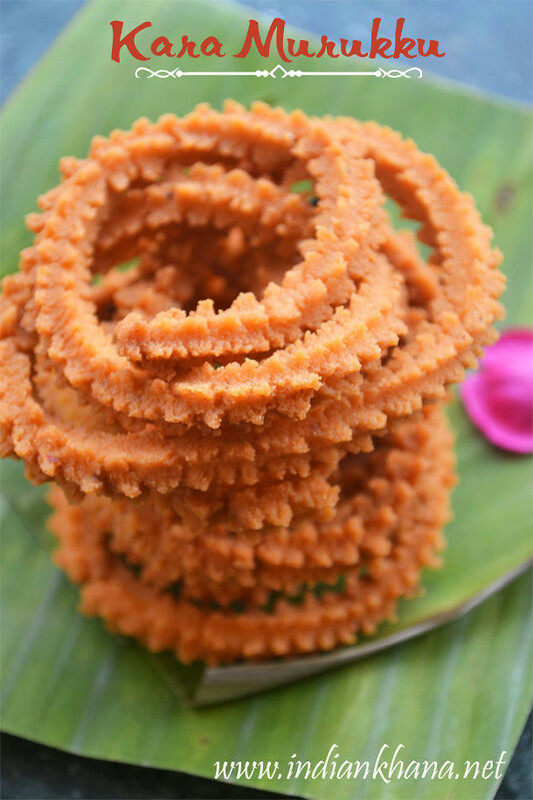 Add samvat chalwa (kuthiravali arisi) stir and cook for a minute, you can see the millets will start to pop, now add water (I added 2.5 cups water), freshly crushed pepper powder, sendha namak (rock salt), mix, cover the kadai and cook in medium flame for 8 to 10 mins to until samvat gets cooked fully, stir in intervals to check if millet got cooked. 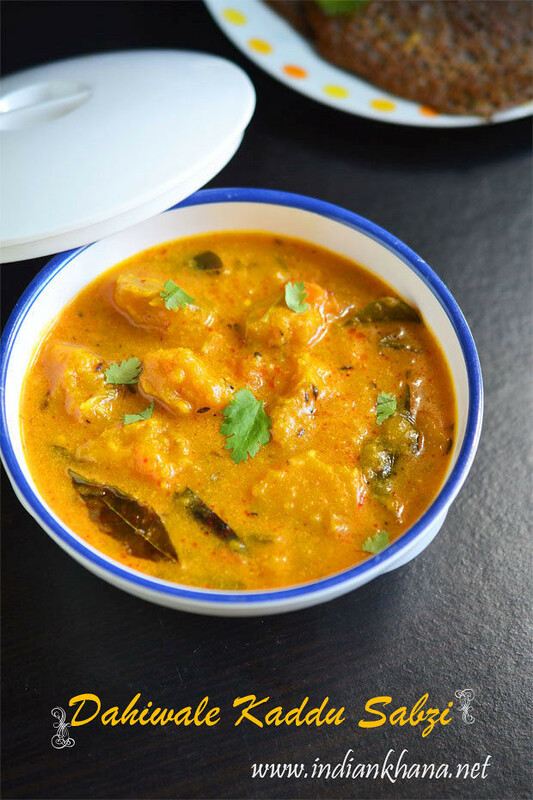 Add coriander leaves, lemon juice mix well to combine everything and off flame. 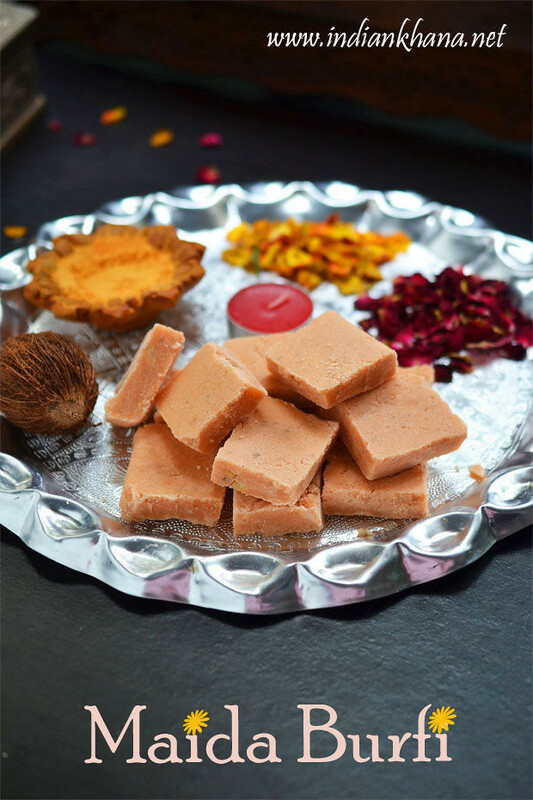 Cover the pan and let it sit for 10 mins before serving, with the steam samvat gets cooked further and all the flavors gets absorb. 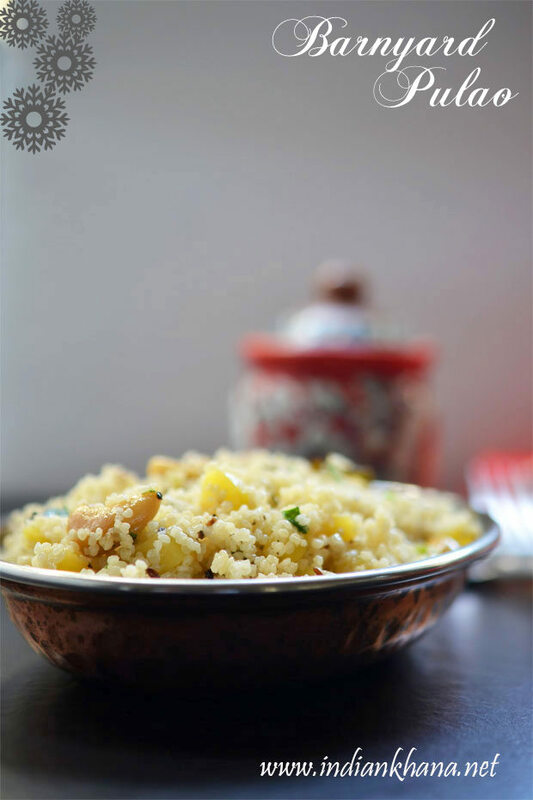 Serve hot or warm with side dish or just like that, this pulao taste yum by itself too. Healthy, gluten-free, vegan and delicious Samvat Pulao.